Well, the Intex Purespa Jet and Bubble Spa Deluxe does pretty much what it says on the tin. 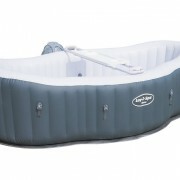 It has both bubbles and massage jets and as a result it is definitely a ‘Deluxe’ inflatable tub. Now, I have to confess that when I am testing these products, I sometimes find it difficult to rate a tub based on the overall bubble/massage experience. To explain, most of these tubs (so as not to be outdone by their competitors) include as standard either a large amount of bubble jets, or a large amount of massage jets. Now, whether I am sitting in a tub with 100 bubble jets working away, or 120 (as with this model), it makes only a marginal difference to me. It is also difficult to rate a tub based on these features, as I feel that I cannot advise consumers like you to choose between either a tub with bubbles, or a tub with massage jets. It totally depends on what you, the consumer, really wants out of the whole experience. What I am getting at, as I am sure that you can see, is that with this tub you don’t need to make a choice! It comes with both features, as standard. Whether you are a bubble fanatic (like me) or need a strong jet focused on your weary lower back, this tub offers both options! As I said, the Deluxe is what it advertises itself as – Deluxe. 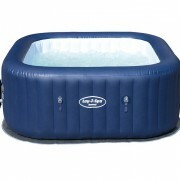 The Deluxe Spa claims that it can fit 4 adults easily. I would treat this estimate with caution, simply because I invited my parents over to give it a go, and my Dad (who is by his own admission not a small man) took up a bit too much room for a fourth family member to jump in. The sides are not as thin as they could be, so I would say that this tub is not exactly economical with the space it occupies. On the other hand, the thicker sides inevitably give the Deluxe more rigidity. Again, this was a blessing in disguise when aforementioned father tried to exit the tub. A less robust product would not only have resulted in reddened faces, but a very wet patio. The Deluxe heats to a comfortable 40 degrees, but unlike other models I have reviewed, the heater does not stay on when the bubble jets are in action. One further issue this reviewer noticed, was that because the bubble jets draw air from outside of the tub, depending on outside conditions the water temperature can drop very quickly. 120 bubble jets blowing cold air on you isn’t everyone’s cup of tea. 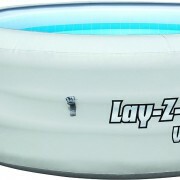 A way to get around this that I used to great advantage while testing, was to inflate and use my tub indoors. 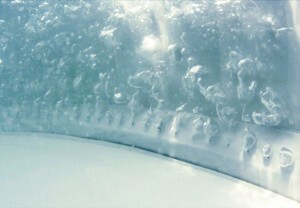 If the air in your house is warm, the bubbles in your tub will be warm. Problem solved. Getting the Deluxe up and running is a two man job, if you want to do it properly, and you do not want to get stressed out. I roped in my partner to help, and although there were some issues of misunderstanding, we got it going pretty quickly. The tub heats at roughly 2 degrees an hour, so we filled it up once it was inflated and were able to jump in with a few beers the following evening. One thing that I have not mentioned up until now, is the pretty unique salt-water treatment system fitted in the Deluxe. At the beginning I confess I didn’t really understand what this was. I was quick to criticise it as a uselss gimmick included so that people could fill up their tub using sea water. As if anyone would do that? You can probably guess that I was completely wrong, and this salt-water treatment system is actually very useful. Instead of the traditional chlorine float that you have to throw in your tub to keep all the nasty bacteria at bay, the Deluxe only requires salt. The treatment system converts the salt into chlorine, making the upkeep of your tub a lot lighter on your wallet. No doubt it is a bit more difficult to get the right chlorine to water balance in the Deluxe, but once you have got the hang of it, it is a LOT cheaper. The Deluxe follows the trend of being made as child-proof as possibe. 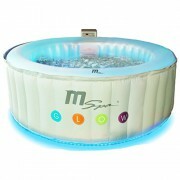 It has an inflatable lid that clips into place to give you some peace of mind. Obviously, it is important that all parents should keep a close eye on their little ones when they are near the tub, as we all know how curious they can be. Especially with something that is covered up and locked away. The top keeps out leaves and other undesirables, and the innovative salt-treatment system makes it extremely easy to maintain the purity of the water. As I said before, the sides are very sturdy, and if they can support my father you can be assured that they are not going to collapse and cause an injury without an effort on the occupant. As I previously mentioned, the Deluxe has slightly thicker walls than other models, but it is very robust and does not cave in lightly. To test this, as recommended by another Amazon reviewer, I took a leap of faith and allowed my dog Sid to get in with me. The Deluxe advertises itself as totally puncture resistant, but I always take this claim with a pinch of salt. Getting Sid in was easy, he has been eyeing me testing these products with envy since the beginning. Getting Sid out was a bit more difficult. He had the best time, and if there was a way for a labrador to write a review, I am sure he would be giving the Deluxe a maximum score of 5 paws. I was genuinly worried that he would cause the Deluxe to spring a leak, but since this occasion I have noticed no damage whatsoever to the inner or outer shell. I am not brave enough to say that the Deluxe can cope with an overly-excitable, long-talloned Jack Russell. Indeed, I am not brave enough to recommend that you follow my example at all. I have included this simply to show you how robust the Deluxe really is. If you do decide to invite your fury best friend to the party, I wish you every success but be warned, Sid is now giving me no peace whatsoever. 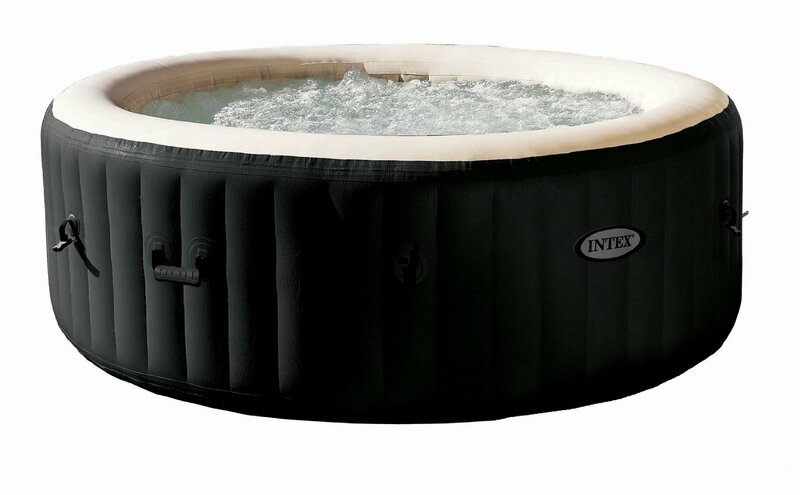 The Deluxe is very similar to other tubs on the market at this time. 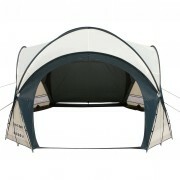 It is a good size, it is especially sturdy, and it heats up to a very relaxing temperature. The things that set it apart are the fact that you can use both bubbles and massage jets, and also that you can use cheap household salt to keep it fresh and clean. This last one may not seem like a huge plus point for the Deluxe, but when you have used hot tubs as much as I have, you will realise that the cost of chlorine floats really adds up over time. The Deluxe is well worth it’s price tag, and in the long run you will find it much cheaper to run that other models available on the market.